There was a definite buzz in the air today - after days of setting up and preparations, science was starting. Despite being three days away from our target area, we have deployed the first instruments to collect background data. The first watch started at 0800h with a check and log of all our instruments - particularly the systems giving our exact position, depth of water, and recording gravity measurements of the rocks in the crust far below us. Team HyBIS, led by Bram, has continued to set up their underwater vehicle and today fitted a new High Definition (HD) camera. Being able to zoom in and bring back superb HD quality footage should really make a difference to this expedition, hopefully bringing wonders of deep ocean discovery to life - and giving the biologists vital detailed information on the inhabitants of the Cayman Trough. The big moment of the day came when the Conductivity, Temperature and Depth (CTD) probe was winched into the sea, at around 1300h ship's time. Standing around four feet tall, and carrying a collection bottles and sensors, the CTD is a key instruments for ocean-going scientists. Via its communication link back to the ship, we were able to watch the sensors feed back information about the temperature, salinity, and chemistry of the seawater as it was lowered 4000 metres to the sea floor. 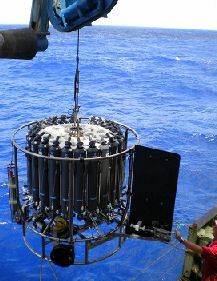 Sending the CTD down and bringing it back up took four hours, and it was constantly monitored from the main lab during that journey. 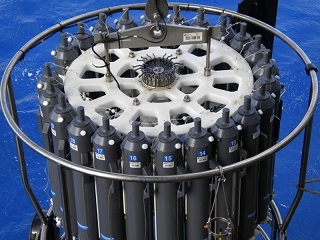 On its return trip - called the up-cast - the CTD collected water samples at different depths in its sample bottles. By watching the data on the way down, the chemistry team were able to decide which layers of water they wanted to sample on the way back up. 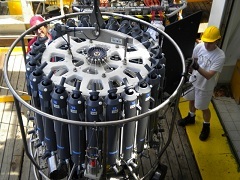 Doug, Carla and Alex then pounced on the water samples as the CTD was brought back on board. Wearing gloves to reduce sample contamination, they decanted the seawater samples into bottles for analysis in their lab. The data and samples from the CTD tell us about the chemistry of the water, which should lead us to the vent sites in the Cayman Trough when we use it there. But today's results - as we're not yet at the Cayman Trough - will provide a baseline for comparisons with those future samples. With the CTD back aboard, we deployed a magnetometer - an instrument that we tow 200 metres behind the ship, and which measures variations in the magnetic field of the Earth's crust below. This will help the geophysicists to deduce the geological history of the Cayman Trough as we approach it. In the evening we resumed our course and speed to the Trough, with the watch teams monitoring and logging the readouts from the magnetometer, gravity meter, and seafloor-mapping sonar every half-hour to make sure they keep working. That routine will continue from now until we reach the target area early on Tuesday.